As 2013 comes to an end I am in a hurry to start 2014. This past year has been quite eventful, some good, some not. The birth of our first grandchild was definitely the highlight, born in October while the Larch trees turned a golden yellow, he is a perfect little angel. It was a wonderful event in the midst of chaos and uncertainty that was the rest of my life. I decided to start this blog as a record of what I hope to be monumental changes in my life. I am a social worker by profession but after 14 years I am wanting to move in another direction. I discovered the art of mixed media a year ago, and fell instantly in love with the process of painting, collaging, inking, and stamping. Playing with colors and layers and textures as a means of expression. 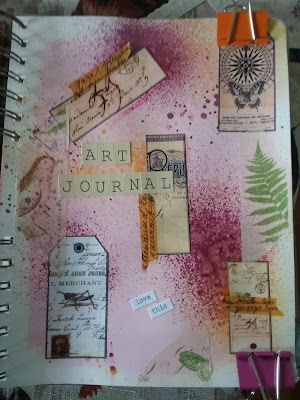 Art Journaling and watching YouTube tutorials, discovering blogs written by other mixed media artists, delving into Stampington and Company's mixed media magazines, it was a whole new world to which there seemed to be no end. My greatest wish is that I can somehow combine work and play. My 2014 horoscope says that career wise I should pursue a hobby or something I do on a part time basis as a new career path so maybe this is the year that I get to do something fun for a change!